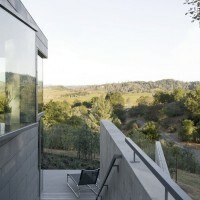 Cooper Joseph Studio designed this house in the Dry Creek Valley near Sonoma, California. 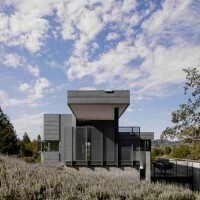 This agricultural property in Sonoma is for two scientists. They are involved with a number of agricultural projects – olives and olive oil; bee keeping and honey production; extensive gardening and various other endeavors that take advantage of the area’s climate, soils and siting. As part of the “locavore” movement, they bring their produce to local markets and restaurants. This area is a place of extremes and contradictions. It has severe droughts and as well as floods and mudslides; searing summers and killing frosts. Their 25-acre site had no infrastructure and a dilapidated house. 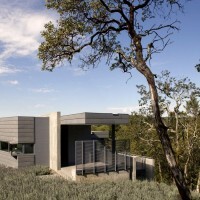 They asked us to make a new, efficient structure that would take advantage of hillside views. As part of the site work, we buried utilities, improved grading to eliminate erosion, and built a large solar array able to power the entire property and all equipment. Excess above need (which has occurred in most months since installation) is directed to the local provider of Pacific Gas and Electric. The house is 850 square feet on three levels. Situated at the top of an olive orchard, the exposure faces north, taking advantage of the breezes, and shade from existing forests to the south. Exploiting an existing open area with particularly hard clay soils we removed no trees. The goal was to create an energy efficient, compact dwelling where the clients could sit in shaded areas, entertain friends with their own food production, and enjoy the wonderful views across agricultural lands. 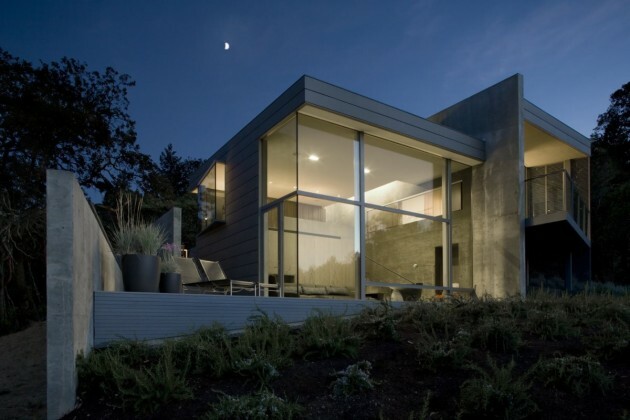 The structure is anchored, to the steep hillside with a series of retaining walls and cascading exterior decks, each linked to an interior space. 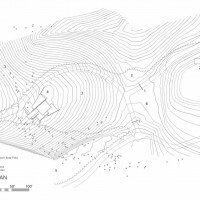 This act of at once embracing the hillside and relating inside and outside at every level is an ambitious concept for such a small house yet the one least intrusive to the natural topography. The circulation always directs you to the views while the fenestration protects from the hot southern sun in favor of soft northern light. 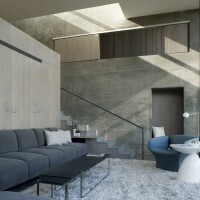 The main interior stair skewers the levels along the predominant central concrete wall. Nestled into a field of lavender we added a few varieties of rosemary on the north side of the maintaining this native, reductive palette both inside and out. These plantings are coordinated to be constantly humming with bees, as this is a primary food for the owner’s hives. Poured in place concrete is the anchor both physically and aesthetically for the design. The central wall was an extremely complex pour on such a steep site. 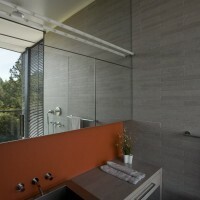 Two-inch recesses and larger openings in the concrete wall form places for sliding doors and hardware, an entry door that is flush to the wall when fully opened, and the opening for a lower level window seat all give detail, texture, and program. At the same time, these details provided challenges for the proper consolidation of the concrete. An immense scaffolding on the hillside provoked jokes about building a Roman theater, but in the end, each concrete wall was made as a continuous pour with superb quality. The builder’s expertise with varied materials and attention to detail made it possible to make this type of highly precise, finely crafted architecture. At once grand and intimate, openings between levels allow for conversation and unexpected views from place to place – it is a fun place to explore and live, a precisely crafted structure in a rustic landscape. 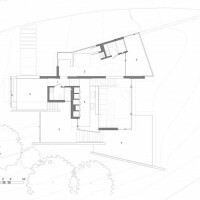 The house is organized on three levels descending with the hill with a 30-foot high concrete wall skewering the plan acting as a visual and structural anchor. Entering from the south to an entry level is a bedroom/bath. The mezzanine level has a kitchen and eating area, and on the lower level there is a living room. Floors/steps/wall tile are a soft grey limestone. All the woodwork is oak, stained grey with inserts of clear acrylic resin. 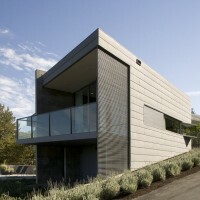 Steel is used for all the exposed structure and mullions and the countertops a grey eco-composite. 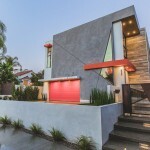 The central concrete wall is delineated with a series of openings and recesses so that sliding panels and doors lay flush or a small niche is available for sitting off of the main living room. The soft grey palette is broken for occasional splashes of color draw your eye, but it is the splaying geometry set against the simple orthogonal lines of the plan that pull you ever outward toward the wide views of hills and canyons green with grapes. The connection to the valley expands as one descends the staircase, losing its separateness to become one with the gray-green grove of olive trees. The exterior is predominantly light-grey zinc expressed in horizontal panels with articulated reveals running horizontally and overlapping joints in the vertical direction. 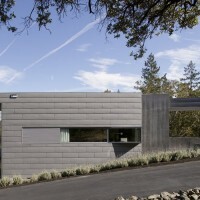 There are some minimal areas of stained redwood to delineate façade compositions and work with the texture of screens. 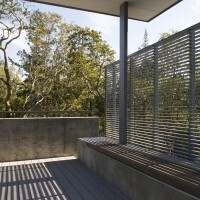 Slatted, redwood sunscreens for the bedroom and entry deck provide privacy and shading. Horizontal skylights over the stair bring daylight and views of the sky thereby creating dynamic shadows in a house that otherwise is shielded from direct sun. Furnishings are mostly custom built-in pieces as the room dimensions are small. The bedroom feels almost like a compartment on a boat, but its bathroom features a shower with 10-foot high glass overlooking the valley. We realized early in the design process that the expansive spirit we were looking for required the use of open corner windows and shifts in the geometry in order to break the sense of enclosure. 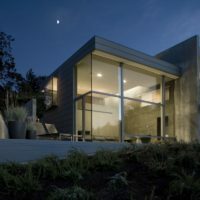 These types of features with cantilevered corners and open glass-on-glass connections required special attention. The elegance of these well-crafted conditions with specific attention to horizontal movement, heat transfer, condensation and other environmental issues required careful detailing and coordination with the contractor at each step of the process. 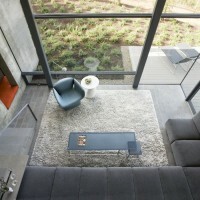 For example, window frames are let into the concrete wall, ceiling and floors. The roofs of the triangulate windows are made of steel plates with special flashing details to work with the zinc wall system. Flush detailing at all places where materials come together highlights the superb local craftsmanship. 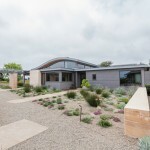 The energy for the house is supplied by a 930 square-foot solar field located on a nearby hillside on the property producing 21,578 kWh per year. The field is elevated 10’ above the ground with an agricultural work shed underneath so it acts as a sun shelter. Xeriscape plantings around the house are essential to conserve water, especially during drought months. After an initial period of stabilization, no irrigation will be required on the property except for the agricultural plantings (olives etc.) Hillside storm runoff is redirected and filtered using a series of culverts, underground piping and grading shifts. Lavender fields around the house hold the soil, preventing erosion but they also provide much-needed food for the owner’s bees. Visit the Cooper Joseph Studio website – here.